Reasons to Believe is a science faith think-tank dedicated to showing that Christianity is true. Recently, I had the opportunity to view their resource, “In the Days of Noah.” The video features a lecture by Hugh Ross regarding the extent, location, and timing of the Noahic (Biblical) Flood. One of the central points of Ross’ argument is that people must take an integrative approach to the question of the Genesis Flood. It is not enough to look at just one verse or one chapter or even one book of the Bible and declare the question closed. Instead, Ross argues, one must take the entirety of the Scriptural data and see what it tells readers about the Flood. Not only that, but the relevant scientific findings must be taken into account as well. For many Christians, the extent of the Flood is taken as a test for orthodoxy. Ross argues convincingly, however, that the Biblical account does not necessitate that the Flood covered the entire surface of the planet. He goes over a wide range of texts that discuss events that are said to be “world wide” or to “cover the whole earth” or that are supposed to bring “every nation” to a certain place and shows how the usage of the term was relative to the author. Ross cites a number of texts to back up this claim and shows how in many places–the Joseph narrative, writings about Solomon, etc.–the words taken as universals generally (“whole earth,” “all nations,” etc.) are used specifically to mean the whole immediate/relevant world. There are a number of texts describing creation that go into greater detail about specific aspects of the Genesis account. Ross outlines his argument via these texts by specifically noting a number which discuss the limits set for the waters. For example, Proverbs 8:29 states quite explicitly that God gave the sea its boundary. Ross continues through the Bible and cites numerous examples wherein it talks about God setting boundaries for the waters. From there, he makes the argument that these verses give us a principle: God has set the oceans in their boundaries from Creation. He then utilizes this as an argument for a local flood as opposed to a global flood. I think that this may be the weakest part of Ross’ argument, because it is possible to counter this reasoning by saying that just because there are a number of texts talking about the boundaries set for the water, it does not mean that the water can never cross these boundaries. In fact, one might counter by noting that Ross’ view entails a kind of uncertainty over what exactly is meant when the Bible discusses the boundaries or limits for the oceans. After all, even on Ross’ view, some body of water covered a vast expanse of land–indeed, the whole inhabited world at the time. In fact, one may argue that due to what we know about plate tectonics, the oceans have not, in fact, had clear boundaries from the beginning but have instead been shifting as the continental plates drift. Of course, Ross could counter by noting that those continental plates themselves act as boundaries for the oceans. Even though these plates shift, they remain ‘fixed’ in the sense of constant. Regardless, it seems that the rebuttal given above must be given at least some weight in considering Ross’ overall argument. However, even if one denies the force of his argument for the Scriptural notion of fixed boundaries as being a limit for a global flood, one must still contend with his argument to open up the possibility of a local flood by noting the difference between general and specific uses of the notion of a “worldwide” event. That said, Ross turns to the scientific evidence and notes a number of evidences against a global flood. First, there are such things as unambiguous signs of a flood. He points out the possibility of checking ice cores and sediment cores for the continuous record of the last several hundred thousand years, so if there was a global flood there should be a signal in the ice layers evidence for a global flood. These layers are annual and we know this by looking for volcanic eruptions lined up in the layers at the correct times. These can therefore be calibrated by lining them up with volcanic eruptions that we know of historically. Moreover, the ice layers line up with the ellipticity of the earth, so there are multiple independent ways to test these ice layers. However, in these layers there are none of the telltale signs for a global flood. So where was the flood? Ross notes a number of verses in the Bible to narrow in on the location of Eden, and then extrapolates from that where civilization would flourish. Due to some geological evidence for there having been a blockage on the end of the Persian Gulf which would have, combined with the melting of ice and the extreme amount of rain noted in the Biblical account, flooded a huge portion of the Mesopotamian Plain. The region is surrounded by mountains which would have blocked in the water for the flood. Such a flood would have wiped out the extent of known humanity at the time, argues Ross. There are a number of arguments that young earth creationists, who often rely upon “Flood Geology” to explain a number of features of the geological past to maintain their view of the history of the earth, would raise to Ross’ presentation. 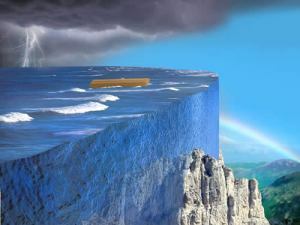 For example, the image on the right was created by Answers in Genesis to parody the notion that a flood can be local when the Bible says that even the mountain-tops were covered (Genesis 7:18-20) [all credit for the image to Answers in Genesis, I make no claim to having produced it in any way]. Ross answers this argument by noting that the word can also mean hills and that with the extent of the flood he proposed, there would be no visible hills or mountains from the Ark. Thus, Ross’ argument is much along the lines of his integrative approach: that we must take into account all the relevant Biblical texts as well as noting the scientific evidence. It would be remiss to have a review of a video without looking into the visuals. The video is a lecture divided into chapters, so a decent portion of it is spent watching Hugh Ross talk. However, there are also a number of very useful images and slides presented which will provide viewers in groups with opportunity for discussion and individual viewers with valuable resources to discuss the Biblical Flood. 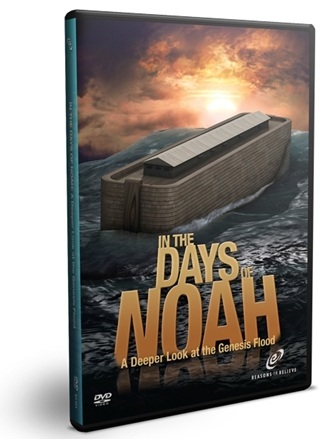 “In the Days of Noah” is a great resource for those interested in the Noahic Flood. Hugh Ross is a lucid thinker and clearly lays out his perspective on the flood in terms that listeners will easily comprehend. Ross’ case is based off a holistic approach to natural and special revelation. Although Ross does not answer every counter-argument which those opposed to his view may present, the video can act as a valuable way to open discussions and perhaps come to a better understanding of God’s truth. “In the Days of Noah: A Deeper Look at the Genesis Flood” (Reasons to Believe), 2010. Image Credit for the second image goes to Answers in Genesis. I was recently at the Evangelical Philosophical Society conference (see my thoughts on every talk I attended) and one of the sessions was a debate between Gregg Davidson of Solid Rock Lectures and Andrew Snelling of Answers in Genesis on “Scripture, Geology & the Age of the Earth.” A number of readers requested more information on this talk, and I found it very interesting myself. Here, I’ll touch on the highlights of this dialogue as well as my own thoughts. Gregg Davidson, a geologist who authored When Faith and Science Collide , and is a lecturer for Solid Rock Lectures, began the dialogue by noting several themes in the young earth/old earth dialogue. First, he noted a tendency to present young earth creationism (YEC) as the only Biblical worldview, while also presenting evidence for a young earth as exceptionally strong in contrast to weak evidence for an old earth. Unfortunately, Davidson pointed out that many people get to schools where they learn geology, astronomy, and more in the sciences and discover that the evidence for the young earth is actually fairly weak, while that for an old earth is quite strong. And, because YECs often link young earth creationism to being the only possible Biblical worldview, they begin to view the Biblical worldview as a whole as extremely weak. If the evidence for YEC was so weak as to falter, then because it is inherently tied to the Biblical worldview, that wolrdview must itself be extremely weak. Another problem is that YECs fail to recognize that their position itself is an interpretation of Scripture. Their view is not Scripture itself. There is a tendency in debates about theology to view one’s own position as what the Bible teaches, but that fails to take into account the possibility of fallible human interpretation. Davidson argued for an approach to Scripture that takes note of the fact that God often deigns to make use of “the knowledge of the day to communicate truths about the nature of God.” As an example, he referenced Jesus saying that the mustard seed is the smallest seed of all the plants on earth, despite the fact that it is not (Mark 4:30-32). The point was not the size of the seed, but rather the power of faith. Thus,we must be careful not to make Scripture teaching something it does not claim for itself. He pressed that to read into the Genesis text specific dates and time periods is to make the text teach something that it is not claiming. Turning to the science, Davidson noted that there are any number of evidences for an ancient earth, but that he chose to focus upon just one area from a number of evidences in order to show how interdisciplinary and cross-confirmed the age of the earth is. He focused upon the Hawaiian Islands and their formation and age. There are multiple, independent ways to investigate the age of these islands. The islands were formed by a hot spot–a place where magma shoots up from underneath the crust and bubbles to the surface. This eventually would form islands when enough of the lava cooled and hardened. The islands are on a moving continental plate and so as they move away from the hot spot, the expectation is the islands get progressively older. Thus, in a series of 3 islands arranged thusly: 3-2-1-0 (0 being the hot spot), 3 would be the oldest island. Davidson first noted the ages that were found by testing the age of the volcanic rock with radiometric dating. These ages yielded millions of years. Now of course most young earth creationists hold that radiometric dating methods are deeply flawed, but Davidson noted that this procedure can be tested for accuracy with independent methods. Before turning to that, he showed a picture of what the estimate for the movement per year of the plate over the hot spot would be based solely upon the radiometric dating. Basically, this works by just taking the distance of 3-2-1 and measuring how far each is from the hot spot, then dividing the radiometric date by that distance to see how far the islands move per year. The estimate yielded movement of 2.6-3.6 inches per year. Recent technology has allowed us to utilize Global Positioning Systems (GPS) to actually measure the rate that the islands are moving. These measurements yield approximately 3.1 inches per year, which is exactly in the middle of the estimate given by the radiometric dating. Given the measured rate, scientists can extrapolate how many millions of years old the islands are based upon their distance from the hot spot. It’s kind of an inverse way to get the date. They simply divide the measured distance of the islands from the hot spot by the measured rate of movement per year. Of course, this way of measuring is not dependent in any way upon radiometric dating. Thus, there are two independent sources showing the date in millions of years for the Hawaiian Islands. The coral growth around the Islands was a third confirmation of the ancient age of these formations. This argument was more complex than the first two. Basically, it seemed the argument was that because different corals form closer to the surface, we can look at the coral reefs formed around the islands as they are farther out and see how much the coral has moved up the island as it subducted (moved under the water with the continental plate). Thus, as the islands move farther away, and therefore sink into the water, the coral that can only survive at certain depths is submerged too far for it to get adequate sunlight, and it dies. One can then measure radiometrically the age of rings of corals. When one measures the coral on the islands, they can correlate that with the ages of the corals and the islands themselves. This measurement also lined up with the previous two. Davidson concluded that the problem with the YEC paradigm is that they will often focus upon rebutting multiple, independent claims. While this may work for each claim individually, the problem is that all of these types of evidence add up to form one cohesive picture. When they are cross-referenced and they all hit on the same age or date range, they all show the same predictions of distance, and the like, it becomes extremely implausible to say that every single way to find the age of the earth is faulty. They form a full picture. Furthermore, Davidson critiqued YECs for often presenting a selective picture of the evidence–only showing the evidence which favors their position. Andrew Snelling is a well-known proponent of YEC, the author of Earth’s Catastrophic Past , and his presentation was perhaps the best defense of his position I have ever seen. Snelling began by offering the common argument that Jesus taught the global flood and young earth creationism. He argued that the Hebrew word used in Genesis 7:17 is only used for this event, which hints at the incredible devastation. 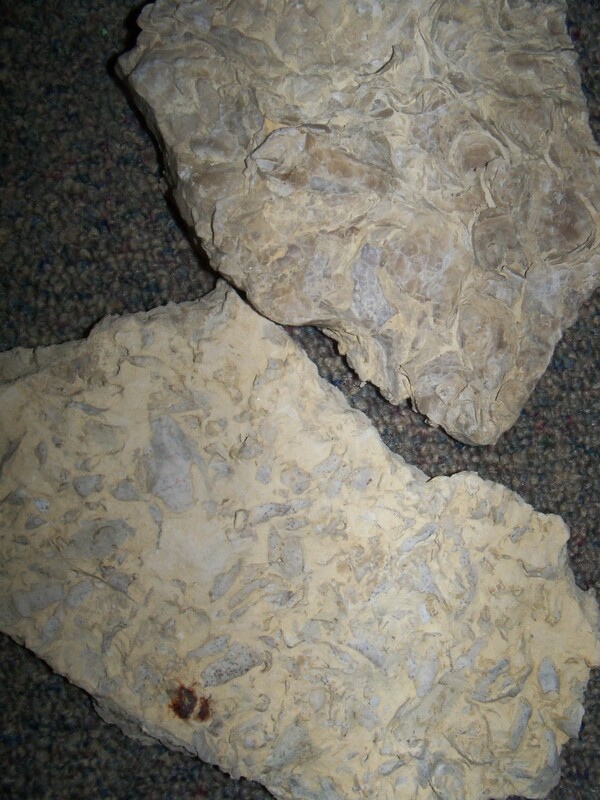 1) Marine fossils in strata for terrestrial creatures- Snelling named a number of places these could be found. This is an expectation because the Flood covered the whole earth, so the creatures should all be mixed together. 2) Rapid burial of creatures and plants- Snelling noted a number of places where fossils show rapid burial. This is expected because the Flood would have suddenly come upon these creatures. 3) Fossil graveyards- The Flood would have killed huge numbers of animals, so we should expect to find huge fossil graveyards, which we do. 4) Evidence that the ocean flooded the continents- if the Flood were global, we would expect to find its sedimentation upon the continents, and we do. He argued that these are all evidenced in Earth’s catastrophic past, and he pointed to the Grand Canyon as evidence for a number of these evidences. Snelling also looked at various geological features he said were evidences for a global flood and a young earth. Among these were several layers of sedimentary rock which are bent. He argued that this can only occur when the rock is liquefied like cement–otherwise it cracks–so this sedimentation had to happen during the Flood. Davidson asked Snelling about the Grand Canyon: specifically, he noted that the terrestrial fossils were found in similar strata, but never in the same layers, which instead suggests an ebbing and flowing of the water; not a global flood. Furthermore, he pointed out the lack of any pollinating plants in an entire mile of sediment. He asked how Snelling’s account lines up with this data. Snelling responded by arguing that the fossils are indeed mixed together and that we even find footprints in the wrong layers. He argued that due to “devastating tsunamis” which would have swept the earth, some of this could be undone and/or specific types of creatures/plants might have been swept out of the layers. Snelling gave a brief outline of problems with radiometric dating giving divergent ages and asked Davidson to comment on the difficulties he pointed out with radiometric dating. He argued that often, old earth proponents and “secularists” simply assume an age for the rock and interpret the tests to get that age. Davidson responded noting that he worked with radiometric labs for quite some time and that there is mixing in the chemicals which can be accounted for. He showed a picture showing how some of this can work and how labs have to account for certain elements contaminating the rocks. However, he pointed out there is a margin of error to account for some of these difficulties. Davidson then brought up a slide with images of bent rocks. One was a “bench” at a graveyard in which the middle had sagged despite being made of stone. He argued that with enough pressure/time rock can sag under its own weight or (as the picture showed) even no weight at all. Given this evidence, he asked why bent rocks should count in favor of YEC. Snelling responded by saying that hard rock can be bent by pressure but that if the pressure is sufficient the rock will crack. He continued to emphasize that in the Grand Canyon one can observe rocks bending without fracture. I have to say I was struck by how much this interaction turned on the scientific aspects of the debate. I had thought that Snelling would focus more upon an attack of Davidson’s interpretation of Scripture, and while he did some of that, the majority of his responses were related to scientific arguments. Davidson followed suit and kept hammering examples that showed how the YEC interpretations Snelling gave of various natural phenomena failed. Davidson’s scientific presentation in his paper was extremely strong. It would be very hard to explain away the fact that three completely independent methods for dating the islands lined up so clearly to point towards an ancient earth. If I had been on the border between young earth or old earth going in, I would have come out as convinced of an old earth. I actually did go in as one who holds to an old earth, having been convinced by the evidence a few years ago, and I came away utterly convinced that YEC is false. Snelling’s talk was a great defense of the YEC position, but it demonstrated the flaws that Davidson was quick to capitalize on. I was really impressed by the fact that Davidson had a number of slides ready to respond to both Snelling’s presentation and his questions. Davidson’s critique of the “bent rocks” was particularly devastating. Davidson’s critique of YEC: that they focus upon independently repudiating various dating methods, came to fruition in this discussion. He really showed how the YEC paradigm is utterly dependent upon a selective presentation of data at the exclusion of pieces that do not fit. One thing I would have liked to see was more debate over the Flood and the Bible passages in general. I was surprised by how much the talk focused on the science–though that was extremely interesting. Let me know your thoughts on the topic. Have you any insights on any of these issues? I have written on other talks that I attended at the ETS/EPS Conference in 2012. Specifically, check out my post on Caring for Creation: A discussion among evangelicals. I have also written briefly on every talk I attended. See my post on the ETS/EPS Conference 2012. There are a great many posts on creation issues on my site. You can access them by checking out my page on the Origins Debate. Naturalis Historia is a site that focuses primarily on the scientific evidence for an old earth. I highly recommend it. For the theological aspects of the debate (and also more of the scientific discussion), check out The GeoChristian as well as Geocreationism, two fantastic sites. Finally, for a comprehensive Biblical and scientific old earth view, see Reasons to Believe. Ken Ham recently released a rant about compromise in the church. Rather than evaluating any single point, I’m just going to go through a short, point-by-point response. Quotes from the article are in block quotes. I would like to know what the “reformation” is that Answers in Genesis (hereafter AiG) hopes to bring about. I suspect it is a reformation of young earth creationism, but that seems to be a fairly major position within the average church anyway. A “reformation” is never restricted to just one point, however, so one must wonder what theology it is that AiG hopes to bring to the forefront. Ken next turned to an attack on the ministry group, “Stand to Reason.” Note that the reason it is under attack is because the group is teaching “to think in terms of millions of years and evolutionary ideas…” I found this quote particularly strange, considering that Stand to Reason is a specific and vocal advocate of Intelligent Design. The group goes so far as to offer Intelligent Design as “a scientific alternative to evolution.” As far as “millions of years,” one may say that this is indeed part of teaching people “how to think.” Let’s investigate the evidence. Let’s come to our own conclusions. Let’s think about it. It seems particularly strange to see an AiG person complaining about others teaching “how to think” because anyone who disagrees with the AiG position on the age of the universe is labeled, ironically, a “compromiser.” Only if you hold the position AiG desires you to hold are you someone who knows “how to think.” Seems like a very strange way to teach “how to think,” doesn’t it? Hugh Ross is a favorite target of groups like AiG. Why? I suspect it is because Ross doesn’t focus exclusively on scientific evidence (which young earth creationists tend to reject as “a different interpretation of the same evidence”) but instead offers alternative theological interpretations. That aside, this quote from Ken Ham is factually incorrect. It makes me wonder whether he has interacted with Ross’ works on a thoughtful level. Ross certainly doesn’t hold the position outlined above. Ross does believe the timeline science has uncovered matches up with the Biblical account. The important distinction is that Ross leans towards progressive creationism (in the writings of his I have read); in other words, God created species over time. When one species passed away, God brought forth a new one. Initially it may seem that this is how Ham described Ross’ position, but note the last clause in which Ham says this is a form of theistic evolution. That is absolutely incorrect. I know of no theistic evolutionist who would agree that God brings forth new species over time in special creative events. None. Rather, it seems Ham is just using the scare word “evolution” and associating it with any position he disagrees with (see Stand to Reason above). Another juicy quote. Let me break it down. First, Ham is tugging the standard YEC line that anyone who disagrees with their interpretation of Scripture is “compromising” by using “man’s ideas.” Essentially, if you are a Christian who doesn’t believe the universe is 6000-10,000 years old, you are compromising Scripture. Never mind a huge amount of exegetical evidence to the contrary (one thinks of C. John Collins’ study of Genesis; Hugh Ross’ own theological work; Sailhamer; Walton’s important study of Genesis in light of ANE cosmology; etc. ), if you disagree, you can’t possibly take Scripture seriously. I have run into this personally a number of times. If you disagree, your position simply cannot even have any merit. Never mind if you offer a reading of Genesis which more closely matches the theological/cultural/historical aspects of the text, you’re just wrong. The problem is that, as is typical in these types of discussions, such a rejection would be an unfair reading of the opposition. Ham and others put scare words like “evolution”; “compromise”; and “man’s ideas” in the context of their opposition. The tactic is highly rhetorical and has little, if any, substance. The fact remains that Ham is cherry-picking ideas from the opposition, putting them in context with scare words, and then declaring victory. Overall, one must wonder about a few things based simply upon this recent article. 1) What kind of theology is a group like AiG trying to “reform”? Is their perspective limited only to the age of the universe, or do they have a broader vision? 2) Did AiG inaccurately represent their opposition? 3) No matter what side we take in this debate, should we not try to be fair and honest about the other side’s view? 4) Was Ken Ham fair and honest? Source: “Compromise Being Spread” Ken Ham, http://blogs.answersingenesis.org/blogs/ken-ham/2012/05/08/compromise-being-spread/. Imagine an earth covered with 15 creatures per square foot. And no, these creatures are not merely bacteria; rather, they are animals which can produce shells. The sheer amount of biomass would be so great that none of the creatures could survive. Their food would all be gone and their habitat insustainable. Over at Naturalis Historia, the Natural Historian has written a compelling article about how just the fossilized shells in one portion of the Midwest lead to extreme problems for the Young Earth position. The author of that post did a brief survey of fossils over a 300×500 mile section of the Midwest from West Virginia to Eastern Missouri and from southern Kentucky to the middle of Indiana and Ohio. Utilizing samples and several calculations which were based off of these samples, he decided to try to calculate how thick a layer would be of fossils if just this area (totally covered in fossils) were spread out over the surface of the entire planet. He was able to conclude that “15 shells per square foot are estimated…” over the surface of the earth just from this sampling. Readers should note that in his article he utilized the lower end on his estimates in order to avoid tilting the scale in favor of an old earth position. 1) Not all the surface of the earth was ocean before the flood, if we say that 50% of the surface was land then that would mean there were 30 shells per square foot in the ocean. 2) In addition, most organisms that produced these shells likely could only live in shallow water along coasts not in the deep ocean so unless the whole ocean were very shallow (and I think some claim that it was, although that presents some other very perplexing problems) then that would also dramatically reduce the space in which these shells could have grown and died. 3) The shells are not sorted at all by size, as very small (<1cm) to large (>4cm) shells are always found mixed with one another. Each of these is presents a different difficulty with YEC. For, as the author noted, the shells he surveyed is only one small sample of untold amounts of these deposits across the surface of the earth (see below for my own samples and some analysis). Now if YEC is correct, then all of these creatures would have had to live over the course of around 10,000 years (or fewer). Think about that for a moment. I know from personal experience that the area covered with these shells is about twice as large as estimated in the numbers already referenced above, and so we are then talking about 30 creatures per square foot over the surface of the earth. But then consider that these types of formations can be found across America and across the earth. I have no way to estimate the numbers, but ultimately we’re talking about a simply astounding amount of life living on the surface of the earth in that short of a time span. It would be physically impossible for the sheer weight of living creatures to survive at the same time. If the Earth were only about 10,000 years old, then we would have been knee deep or even buried in shell-producing creatures over the course of our lives. Not only that, but these creatures would have been competing for resources like food and air (think about how much oxygen these creatures would have sucked up all at once!). And again, it’s not like the entire surface of the earth would have been habitable–these creatures live only in shallow waters. It doesn’t seem unreasonable to think that if all these creatures lived over the course of 10,000 years then the oceans would have overflowed with them. The image I have linked to the right shows a pair of stones discovered in limestone in Kansas. There were literally dozens of feet of fossils just like these as far as the eye could see in the Castle Rock formation in Kansas. One could just walk up and pick a rock up off the ground and it would be like the picture to the right. There are places one can’t walk without stepping on large numbers of fossils. The picture that is at the beginning of this post is a picture I took while in this formation. It is not just the author of the article above who has observed the seemingly unending supply of fossils throughout the Midwest. 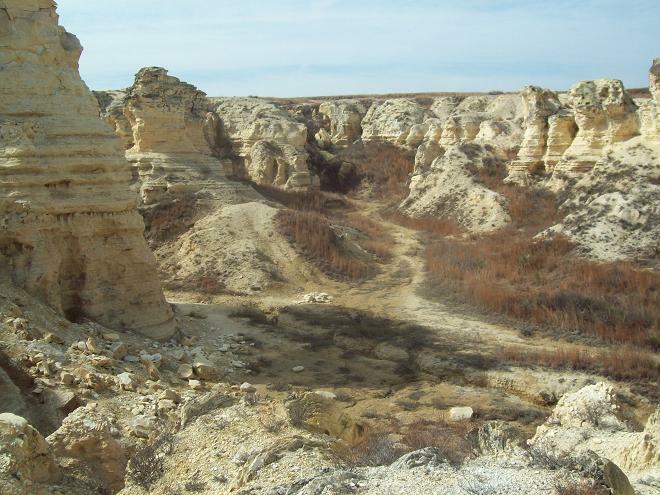 I myself have observed limestone formations with fossils like these across Kansas for hours and hours of interstate. Not only that, but I grew up in northwest Indiana and observed massive limestone formations there as well. Here in Minnesota, one can also observe limestone along cutouts of the highway and elsewhere. One can go to areas along the Mississippi here in Minnesota and pick up fossilized shells along the riverbed. So imagine that the estimates listed above by the Natural Historian are correct on the low end. Now imagine that all of Kansas is covered with these shells–I can attest to it. Imagine further that more portions of the Midwest are covered with other types of limestone which also would have added to the biomass of earth. Again, the numbers are staggering. How in the world did all of this biomass get here within a few (10?) thousand years? That is the question which young earth positions must deal with. Note that the argument and evidence in this post do not rely upon any dating system, any background knowledge, or other scientific dating systems YECs tend to denigrate. Note that the argument only shows what is observable and asks a question: how did it get here? YECs would have to come up with some way to plausibly explain how all these creatures could have had their lives condensed into about 10,000 years. God is not a liar (Numbers 23:19). The natural world attests to Him (Psalm 19). These conjoined Biblical points tell us that when we go outside and observe that the life we can observe in the past could not have all lived within 10,000 years, then it did not. Those who claim otherwise seemingly must either introduce a third option (some plausible explanation for these creatures’ lives–and note that it must be more plausible than the argument that they lived and died at the same rate they do now and that the world is simply old enough to have had that much life and death over the course of time) or they fall victim to a dilemma involving the cited verses: either the natural world does not attest to the Truth or God is actively deceiving us. The bottom line is that this is just one more hole in the Young Earth position. YEC is, simply put, false. Take a trip through the Midwest sometime and look at the cuts through the highways. Every single time you pass through one in Kansas it is absolutely filled with limestone and fossil-rich rock. The same happens through most of Missouri, Illinois, Indiana, etc. I could literally walk up to a wall of shells and pull out a huge sampling of them. Now suppose this isn’t representative. Suppose that it just so happened, at random, that the roads were set up in such a way that they only hit the most fossil-rich deposits out there. What does that mean? Not very much. We can observe these same deposits all over the world. The sheer amount of these deposits means that we could very easily produce the number of fossils Natural Historian estimates over just the Midwest. Again, to clarify, I’m saying let’s assume that Natural Historian overestimated several thousand(milliion? )-fold and so the number of fossils he estimates for the midwest can only be gathered if we collect them from all over the earth, and only from those highway cuts or other points of exposure where such deposits have observed (again, making the extreme assumption that only those places which have happened to get hit by highways or erosion are those with these deposits). But in that case, we can still gather enough fossils to say the entire surface of the earth could be covered by about 15 fossils per square foot. But wait–these fossils don’t occur in deep oceans or on land. They only occur in shallow oceans. Suddenly we’re up to about 30 per square foot if we assume they occurred in water anywhere (including riverbeds, deep oceans, and the like). But eliminate the places these types of fossils do not occur and the number of fossils increases even more. Suddenly we find that the exact problem I raised above remains a problem–even if we only take those fossils which are exposed now (and again note that this is a huge underestimate and requires extreme blind faith that there are no other fossils under the ground anywhere, not to mention the fact that there may be even more fossils that are exposed which could drive that number up exponentially). There has been simply too much life on earth to maintain a young earth position. Arguments for intelligent design often hinge upon what mechanistic, naturalistic means “cannot explain.” The arguments go something like “See feature x, how can naturalistic mechanisms explain x? They cannot. Therefore, ID is true.” There is something to be said for this type of argument. If one simply cannot explain a specific thing by means of the mechanisms suggested, one must look for different means. That said, if the case for intelligent design rested only upon negative arguments, it would not be as robust as if it also had positive evidence. Fazale Rana’s book, The Cell’s Design , seeks to present just such positive evidence. The sheer volume of fine-tuning required to make a cell work baffles the imagination and, Rana argues, serves as positive evidence for design. Rana’s argument is an argument from analogy. He draws heavily from William Paley’s “watchmaker” example (If one came across a watch in the sand, they’d know it was designed… Paley argued that one could similarly conclude that life was designed). Rana doesn’t ignore the arguments raised against such analogical reasoning, but confronts them head on. After identifying several criteria which allow proper analogical reasoning (30ff), Rana makes his case for the Creator. The first line of evidence comes from the machines in the cell. Again, Rana’s approach is analogical, rather than negative. The machine-like nature of the flagellum, along with other motor-like cellular functions presents an argument: “Organisms display design. Therefore, organisms are the product of a creator” (86). The case doesn’t rest merely upon molecular machines. Rather, that is but one of the many lines of evidence. Rana draws out the implications of several “chicken-and-egg” paradoxes. These include the “mutual interdependence of DNA and proteins” (99), the origin of proteins themselves (100ff), and more (105ff). These systems present a kind of “irreducible complexity in which the system depends on the system to exist” (108). Other elements of design are present in the cell as well. Aquaporins intricate and detailed workings illustrate the design that is present in the system (111ff). Other detailed, intricate designs (such as collagen, mRNA, and the breakdown of proteins) hint at the need for a designer. But the reasoning is not only supported by the details, it is also bolstered by the structural composition of the cell (126ff). The analogy of cells to machines is strengthened further by the quality control systems within the cell (198ff). Again, the reasoning is analogical–these things are designed, therefore they need a designer. “Information can’t be separated from the activity of an intelligent agent” (142). The numerous examples of information in the cell lead to the inference of an agent. But it is not only the information’s presence that hints at a designer. Here Rana’s case really builds on and develops the work of other ID theorists. The information alone could be enough to infer an agent, but one must also account for the fact that cellular information follows rules like syntax, semantics, and pragmatics (144ff). It is not merely information, it is the use of that information and the rules governing that use that strengthen the case for an agent behind the information. One of the most amazing parts of The Cell’s Design is the chapter called “A Style All His Own.” Darwinian evolution, if rewound, would come out different ways every time. Different mutations would occur, which would lead to different organisms. What is not expected, on Darwinism, is a convergence pattern in evolution. When the same templates keep showing up through independent routes of development, it provides strong evidence for a designer. Yet this “molecular convergence” is exactly what scientists have discovered again and again. On pages 207-214 Rana writes, with citations from scientific journals, of no less than 100 examples of molecular convergence. As a reader, one can’t help but be stunned as they go through these pages. Over and over, there is evidence that the same designs show up in different places, independently, throughout nature. As Rana writes, “if life emanates from a Creator, it’s reasonable to expect he would use the same designs repeatedly…” (215). And this repetition of design is found in life’s most basic components: DNA (216ff). Rana does not ignore detractors arguments against his position. One counter-argument to Rana’s conclusions is the presence of poorly-designed mechanisms in nature. Yet Rana effectively nullifies these examples, citing how many of them have turned out to be optimally tuned for life, and how others may be expected to be equally tuned (258ff). The Cell’s Design is an extremely difficult read, but it does not leave readers who are not scientists to flounder. Rana’s second and third chapters provide some basic biological understanding which readers must have to understand the argument throughout the rest of the book. There is also a 12-page glossary at the back of the book which will let those unfamiliar with the terminology follow along. That said, this is not an easy book. The argument is heavily scientific and involves an exploration, in extreme detail, of the mechanisms and machines at work in the cell. The book presents a fantastic case for ID, but not at the expense of the details. 2) If Y were true, then X would be expected. 3) There is good reason to believe that Y is true. 1) Design is observed in biochemical systems. 2) If life stemmed from the direct work of a Creator, the elegant design of biochemical systems would be expected. 3) There is good reason to believe that life is the product of a Creator (276, these arguments are an exact quote). After reading through The Cell’s Design, this reader cannot help but agree with this argument. Over and over again, Rana has drawn out the exquisite design in the cell. The positive evidence is there, life is designed. 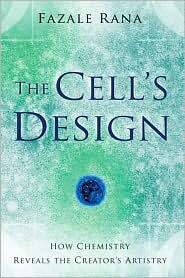 The Cell’s Design presents a phenomenal case for a designer of life. Those interested in exploring intelligent design should add this book to their list. It is not an easy read, by any means, but it provides some explicit, positive evidence for the conclusion that a Creator exists. Those wishing to deny this fact will find much with which they must contend in Rana’s work. I recommend it without reservation. Fazale Rana, The Cell’s Design (Grand Rapids, MI: Baker, 2008). Disclaimer: I was provided with a review copy of this book by Reasons to Believe. You can learn more about this science-faith think tank at reasons.org. Hidden Treasures in the Book of Job (hereafter HTBJ) by Hugh Ross provides unique insight into one of my favorite books of the Bible, Job. Rather than approaching this book as a treatise on the problem of pain, Hugh Ross dives into it in search of scientific truths. What he finds is surprising. Ross begins with an exhortation to Christian leaders to stop avoiding the issue of Creation and to come up with a reasonable “strategy of engagement. Christians who take the Bible as a trustworthy revelation from God need to study science and engage with scientists at the highest academic and research levels” (12). I pray Ross’s words will not fall on deaf ears. Ross goes on to point out the historical backdrop of the book. The debaters present, Job, Eliphaz, Zophar, and Bildad were “likely the intellectual powerhouses of their day…” (28). Along with Elihu, who most likely recorded the book, they comprise the major characters. Interestingly, Eliphaz was named as a Temanite. Teman, Ross points out, “was famous in the ancient world for its exceptionally wise scholars” (28). Contrary to some who may accuse Ross of demeaning the historical value of Scripture, it is clear that he affirms the historical realism of the Book of Job. 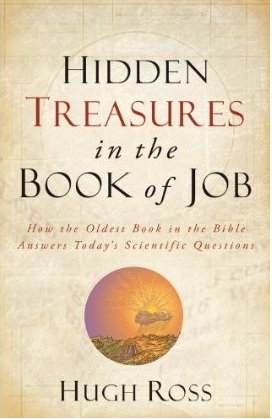 Interestingly, HTBJ doesn’t start with the scientific questions; it dives in to “timeless questions” about God. Ross points out answers given throughout Job about the reason for death (39-40), the shorter lifespans of humans (40-41), blessings for the wicked (43ff), and more. Ross provides an argument about what is often called “natural evil.” He points out Job’s rejection of a “direct cause-and-effect relationship between destructive natural events and the people affected by them” and goes on to argue that scientifically, these “acts of God” are necessary for life (49). Hurricanes, for example, bring a number of benefits (51). Ross quickly moves into scientific questions throughout the book of Job. He argues that God’s challenges to Job and friends reject naturalism, deism, evolutionism, and young-earth creationism (54). Job specifically points out that God continually interacts with creation. Perhaps most interestingly, Ross points out that in Job the Bible specifically points towards the Big Bang–with language of God “stretching out the heavens.” This, thousands of years before any scientific evidence existed (56-58). Not only that, but the book also alludes to dark matter. Rather than treating darkness as the “absence of light” as was the belief historically, Job points out the actual existence of darkness and its separation from light. Here again there is evidence that Job lines up powerfully with science (60-63). Another fascinating aspect of the Book of Job, argues Ross, is its ability to speak to current situations like Global Warming (63ff). 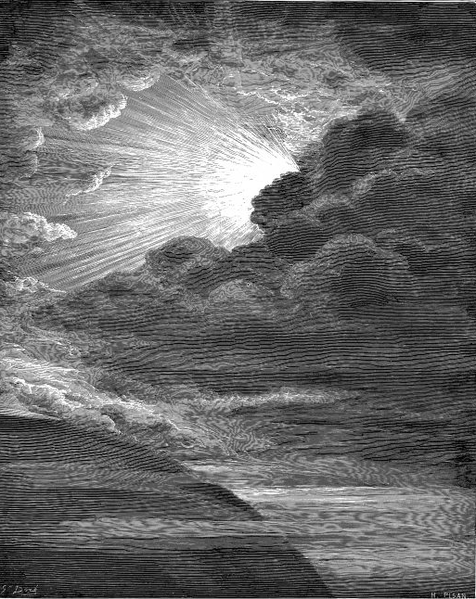 Central to Ross’ argument in HTBJ is the thesis that the book of Job can be used as an interpretive backdrop for the Genesis creation account. Ross argues that Job 38-39 can be read in their entirety as a creation account (72). This opens the gate for interpreting other creation accounts through the lens of Job 38-39. He points out that there are areas of Moses’ creation account that Job makes explicit. Some of these points include a correct interpretation of “heavens and earth” (74); an outline of when plants were created (78-79); and perhaps most interestingly, one of the best explanations of the problem of light before the sun I’ve ever seen (80-84). Ross argues that, contrary to most interpretations, the Genesis account does not explicate that there was no sun before light, but rather that the light had been hidden by the atmosphere (82-83). Again, this would serve as powerful scientific confirmation of the Bible. Ross is unafraid to pull his punches. He takes on the question of the extent of the flood (92ff) and argues convincingly that the flood was localized to all of humanity. Perhaps the most controversial point Ross makes is in regards to one of the best arguments for young-earth creationism–death and the Fall. Often, the young-earth argument is that the Bible excludes any possibility of death before the Fall. Ross argues that, given Job 38-39’s creation account, that interpretation can no longer be valid. He urges that Job 38:39-41 coincides with creation day five, and because these verses include death before the fall, this argument for a young-earth is unsuccessful. Ross’s argument here will really depend upon how convincing his assertion is that all of Job 38-39 lines up with the days of creation. Ultimately, I think, most young-earth creationists will remain unconvinced and argue that only the early part of Job 38 is a creation account. In Ross’s favor is the continuing tense (it appears as though the verbs throughout the section are in the Qal stem). But Ross doesn’t make this argument. Thus, it seems that this part of Ross’s argument will be convincing only to those willing to agree that Job 38-39 are, in their entirety, a creation account. Later, Ross soundly demolishes the young-earth argument that Job provides evidence for dinosaurs living with humans. He convincingly argues that the behemoth is a hippopotamus (178-180) and the leviathan a crocodile (180-183). Ross doesn’t leave the book of Job without discussing what seems like its primary question: suffering. He presents evidence that Job argues for both a greater good theodicy along with a free-will defense (190ff). Both of these sections are interesting, if brief. There are many areas of interest within HTBJ I have left unexplored. Ross focuses extensively on soulish creatures and the differences between humans and animals. Most interestingly is Ross’s explication of the list of 10 “soulish” creatures named in Job and their import for humans (150-165). Suffice to say that there is much more content in the book worth reading. There were times as I read Hidden Treasures in the Book of Job that I was filled with marvel at the magnificence of creation. At one point I stood up and surprised my wife, saying “Can you believe what God has made? And we know it from the Book of Job! Can you believe this! ?” as I described some of the things Ross reveals in the book. There are some astounding ways that the Bible lines up with the evidence we have from cosmology, astronomy, biology, and other sciences. While some Christians may remain unconvinced by Ross’s argument for interpreting Genesis 1 through the lens of all of Job 7-39, the book deserves a reading and response by even those who disagree. Ultimately, readers of Hidden Treasures in the Book of Job will come away with some powerful evidence from science for the truths of Scripture–and vice versa. Source: Hugh Ross, Hidden Treasures in the Book of Job (Grand Rapids, MI: Baker, 2011). This is part of a series of posts on the “Life Dialogue/Origins Debate” within Christianity. View other posts in the series here. The obvious point of contention between Old and Young Earth Creationism (hereafter OEC and YEC) is the age of the Earth/Universe. Hugh Ross argues powerfully for an old universe from both a theological and scientific perspective in A Matter of Days: Resolving a Creation Controversy. 2) Scripture states that God does not lie. God is not a deceiver. 3) Scripture states that nature provides an accurate record of reality, though not a complete record. 4) 1) Scientific evidence (nature) demonstrates the universe is about 14 billion years old, as opposed to the 10,000(ish) years YECs grant. 5) Therefore, the universe is actually old. This follows from the accurate evidence of nature combined with 2) that God doesn’t deceive. If the universe is, in fact, 10,000 years (or so) old, then God has deceived humanity by making it in such a way that it appears to be much older than it is. Premise 1) seems to definitely be the case. First, because the universe, according to the most modern science, is anywhere between 13-16 billion years old. Second, while YEC potentially has theories to explain why earth looks so old without relying on it being created already aged to a certain point (i.e. hydroplate theory), this does nothing to explain the background cosmic radiation; how we can see light from stars that are too far away to be seen yet were the universe 10,000 years old, etc. It therefore seems as though the only way to explain the apparent age of the universe is to argue that it is just that: apparent only. On this theory, God created the earth universe enough to support life, about 10,000 years ago. Premise 2) doesn’t really need a defense (but if desired: Romans 3:4; Numbers 23:19; Deuteronomy 32:4; 1 Samuel 15:29; Titus 1:1-2). Premise 4) is at least implicitly accepted by YECs because they argue that even though science shows the universe is very old, it is not actually that old. It is worth noting that some YECs would claim that “real” and “unbiased” science would not lead to the conclusion that the universe is very old. There is little one can do to counter this claim other than argue that were that true, the YEC account would be able to present a fully testable, verifiable scientific model that shows that things like the background cosmic radiation are false. Finally, the conclusion seems to follow from the preceding argument. God told us nature is an accurate record; He also created the universe (on YEC) in such a way that it appears to be billions of years old, but is not actually that old. Therefore, He created a universe that would deceive us into thinking, falsely, that the universe is old. But, God does not lie, so this cannot be true. Therefore, the universe is old. I find this argument very convincing. It underscores my main problem with the YEC position: namely, that the best evidence does show the universe is old, and so God would be a deceiver were He to make it thusly. This is part of a series of posts on the “Life Dialogue” within Christianity. Check out other posts in the series here. Hugh Ross has been the subject of the last two posts on Old Earth Creationism (hereafter OEC) I wrote in this series on the “Life Dialogue” within Christianity. His work in fields related to this debate has been invaluable to Christians seeking an understanding of the world and Scripture. Thus, I’m continuing the trend of writing about his works for the OEC side of the debate. Hugh Ross argues in Why the Universe is the Way It Is that the incredible fine-tuning of the universe shows that God planned the universe specifically for: 1) the rise of human advanced civilization at the earliest possible time, 2) the triumph of God through Christ over evil, while also keeping the natural laws constant and using a process which took literally billions of years. Ross argues, among other things, that the universe must be quite old. This is the point of contention which is most prevalent in his book, so it is the part I will focus upon. The universe must be old, argues Ross, for several reasons. First, there is the most oft-cited reason: the measured age of the universe, judging from the latest technology, shows that the universe is about 13.73 billion years old (Ross, 44). Second, heavy elements required for life needed time to build up (44), along with radioactive isotopes (45), while “dangerous events” such as supernova eruptions needed to subside (47). Ross further argues that the earth must be quite old (the latest measurements indicate about 9.2 billion years) in order to sustain life. This was because the sun needed time to stabilize, while there also had to be fewer bombardments from asteroids and the like (48ff). Further, continental landmasses had to form in order to sustain advanced civilizations (50ff). Further, Ross believes Scripture backs up claims about the universe. He cites Psalm 104:2 and Isaiah 40:22 as passages which describe the universe as “stretching out” like a tent. These verses, he argues, show a divine inspiration of Scripture, as that is exactly what has been happening with our universe since the Big Bang (131). He goes on to cite extensively verses which point to Scripture lining up exactly with current scientific discoveries (cf. particularly p. 126-145). So what can the Christian take from such an argument? This particular work of Ross’s will (mostly) mesh well with not just OEC but also the theories of Theistic Evolution (TE) and Intelligent Design (ID). It is in Ross’s expansion of his ideas that his view becomes distinct (see this post for a wider exploration of Ross’s arguments). But the conclusions he draws will remain contested by Young Earth Creationists (YEC). The Christian desiring to combat Ross will have to attack the verses he cites while also attacking his scientific model. Again, the YEC could appeal to differing interpretations of the same evidence, arguing that while it may appear that the universe is as old as 14ish billion years (what’s a few million years when we’re talking billions? ), that is only because, as Ross frequently points out, God would know exactly how old the universe would have to be to sustain life. However, God, being all-knowing and all-powerful, could have simply created the universe already capable of sustaining life. Ross would answer by arguing (as he does on p. 147ff) that it may be a false assumption to say that God only wanted to make an environment for humans to live comfortably in (153). Rather, argues Ross, God set the universe up in such a way that humans would not only exist, but also have opportunities to learn, grow, confront evil, explore and wonder at His Divine Nature and His conquest of evil through Christ (153-158). Ross may be challenged from the “other camp”—that is, ID and TE—that he is arguing anachronistically and trying to read science into Scripture. I’m not sure what answer Ross would provide, but I believe he could counter that if God truly did inspire Scripture, then it seems as though God would know how the universe came to be. Not only that, but he could have left “markers” or “indicators” of inspiration throughout Scripture by revealing various truths about the origins and nature of the universe to the authors of Scripture. Thus, Ross might argue, it is entirely valid to treat the Bible as a “science book”, but only secondarily so. Interestingly, those who desire to read Scripture literalistically and apply it to science often fall under the YEC label, given Genesis 1ff, but Ross argues (rather well, imo), that the Bible can be read fairly literally while discovering an Old Earth scenario. Ross, Hugh. Why The Universe is the Way It Is. Baker Books. 2008. Last time I wrote about Old Earth Creationism (OEC), I referred to Hugh Ross’s More than a Theory. Perhaps the most interesting part of Ross’s “Reasons to Believe” (RTB) Model was that in order to harmonize a seeming mix of creationist, intelligent design (ID), and theistic evolutionist (TE) views, the model argued that humans were specially created. This was, I perceived, partially to avoid the problem that can be leveled against TE or ID, which is that man died before sin, which goes against Scripture. Thus, by asserting that mankind was specially created, and only died when humanity fell into sin, the RTB Model avoids this charge. I was surprised to learn that it wasn’t only for theological reasons that the RTB Model made this argument. Rana and Ross (hereafter I’m going to say “RR”) argue in Who Was Adam? that there is reason to believe that Adam and Eve were specially made by God. RR assert that while the fossil record does indeed show evidence various hominids (distinguished importantly from humans), none of these can be seen as evolutionary stages or transitional forms that lead to humans. The RTB model holds that God created the first humans through divine intervention, that all humanity came from Adam and Eve, that humanity originated in a single geographical location, that God created Adam and Eve fairly recently (10,000-100,000 years ago), that humanity’s female lineage would date later than the male lineage, that God prepared Earth for humanity’s advent and created humans at “a special moment” for humanity, human beings share physical characteristics with animals, that humanity displays distinct characteristics from animals, that life spans of humans were much longer at one time, that a universal flood shaped early human history, and that humanity spread from somewhere in or near the Middle East (RR, 43-51). Clearly, I don’t have time to outline the entirety of their argument in a post. I’m only going to hit on the major points. RR argue that molecular anthropology point to humanity’s origin from a mitochondrial Adam and Eve (73 and the pages surrounding). This is due to DNA evidence pointing not to multiple origins, but simply one X and one Y chromosome giving rise to the rest of humanity. This is evidence supporting a number of points in their model outlined above. The next stage in their argument reflects the same idea that I’ve expressed before: different views of the same evidence are possible. I see ways to take the data RR presented here as evidence for evolution, but I also see how it can be interpreted as support for OEC. RR point to the fossil record, which contains various hominids. The archaeological evidence, however, does not support anything more advanced than the most basic usage of tools for these hominids. This, they argue, reflects the “image of God” in humanity. Early humans (contrasted here with hominids) arrive with complex tools immediately, religious beliefs and practices, etc. (77ff, 139ff). It seems to me that RR make a fairly strong case for their side, but the evidence they present could be easily used by theistic evolutionists (arguing within Christianity here) as well. Thus, I don’t think RR have definitively shown that the RTB Model is superior in regards to the origins of man, though they have offered a compelling argument that ties in with the rest of the RTB. Taken as a whole, I believe the RTB Model offers superior explanatory power in a number of aspects. Not only that, but as seen in Who Was Adam? it avoids the theological argument against views like Theistic Evolution or Intelligent Design. I continue to find the RTB Model perhaps the most compelling of any side of the Life Debate within Christianity. As I’ve noted before, I don’t see any reason to throw myself in fully behind any of these views. Rather, I intend to pick and choose based on my presuppositions. In all things, however, Christ has preeminence (Colossians 1:15ff). Rana, Fazale and Hugh Ross. Who Was Adam? Navpress. 2005.